Sri Lanka Navy has rendered assistance to transfer a patient ashore for treatment on being alerted about a sick passenger onboard a German Cruise ship. Alerted by information given to MRCC at 1100 hrs about a sick woman passenger aboard the cruise ship ‘Amadea’ which was heading to Habantota port from Cochin port India, a Fast Attack Craft attached to the Western Naval Command was dispatched to the location of the cruise ship to get the patient aboard naval craft. 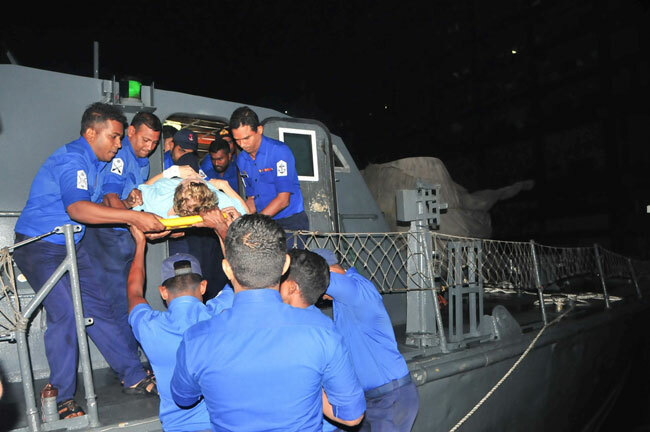 Accordingly, the naval personnel reached the vessel in the seas about 18 nautical miles South of Colombo Lighthouse and safely transferred the patient to the Colombo harbour premises at 1200 hrs. Thereafter, she was admitted to the Colombo Nawaloka hospital for medical treatment, the SLN said.